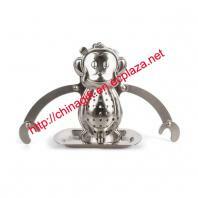 This monkey-shaped, stainless steel infuser has arms, which allow it hang from the rim of your mug. The arms are articulated to accommodate different sized mugs. It snaps open at the top for filling and comes with a little stainless steel tray for catching the drips when steeping is done. Large enough for a single cup of tea. Manufactured in China. Includes box. Our company is specialized exporter, manufacturer and supplier of HANGING MONKEY TEA INFUSER in China.